I suppose that it's possible for any of us to think a certain way about a place - kind of get stuck in it. I recently realized that's what I've done relative to Tokyo and food. Because, noodle, sushi, and tempura are so ubiquitous it's easy - at least it has been for me - to think that it's all there is. Now, I love the noodle, sushi, and tempura - don't get me wrong. 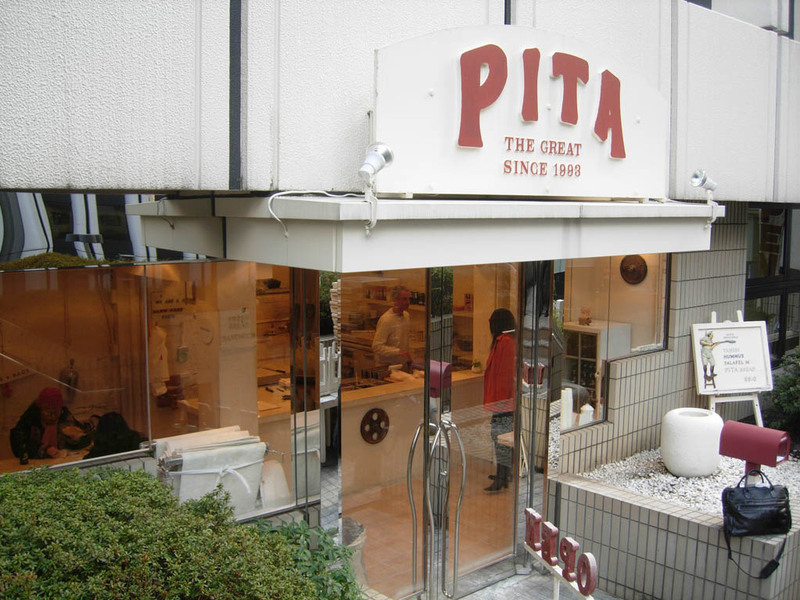 I just thought it'd be fun to check out some, well, really different kinds of food in Tokyo. It's a little hole-in-the-wall place near Tamaike Sanno station (Ginza Line and other subways here - central Tokyo area) - somewhat at the base of the ATT (that's not Ma-Bell) twin towers in Akasaka - I had to walk around to towers to see it - kind of up on the second level from the street. ...Continue reading "Pita the Great - Yep, that's right..."
Whatever you do, please do not send me any of these. I will eat them and get arrested. Have you ever had Fugu? 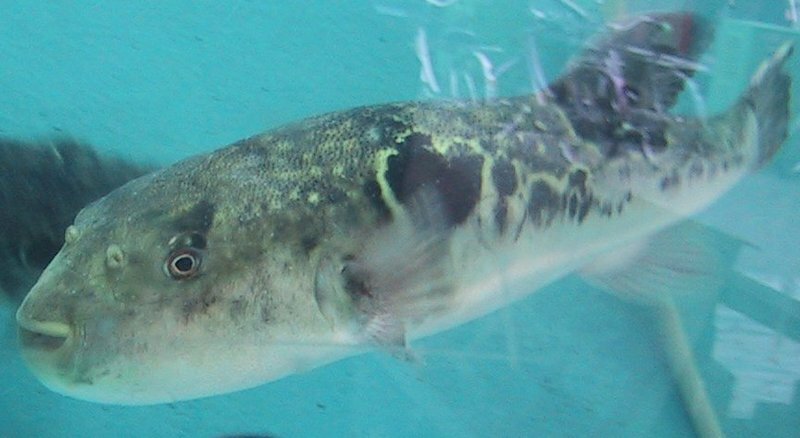 Dear Mrs. Hapke offered thoughts on expanding at table yesterday and in the ensuing comments she asked me whether I had ever eaten fugu - the Takifugu pufferfish or blowfish - in Japanese: 鰒 - a sought after delicacy in Japan. I told my affirmative story there - and I thought later that I might have had pictures. I found them - they were taken with my Japan cell phone so admittedly are not of very good quality, but they do offer proof of my assertions. ...Continue reading "Have you ever had Fugu?" I spent a little time driving through some Washington state backroads this weekend. Tried this recipe from Scott's place before I hit the road. I put two pumpkins worth of seeds in a one gallon plastic bag - added enough Tibvrtini olive oil, and premium asian sesame oil to coat, a few shakes of some strong Louisiana worchester sauce, and a good sprinkling of Scott's incredible Survival Spicetm. Shook vigorously to evenly coat. After an experimental batch, I cooked them up at 300 degrees for about 50 minutes, stirring them in the baking pan from time to time - I shook a bit more Survival Spice to taste during the process (what a great kick!). Seems like the idea is to get them to dry out and get good and crunchy before they burn up. I think it'd be fun to try balsamic vinegar as well with perhaps some marinate time just to see how much more of the bouqet of flavors could be absorbed. These are so good that I want to buy more pumpkins - just to get the seeds. Handful after handful is the way these things go - and they gotta be healthy with lots of fiber and life germ goin' on. What happens to all those pumpkin seeds anyway? Best thing since the snack chip. by the wide mouth of the ever-hungry disposal. What is the most widely eaten fruit in the world? ...Continue reading "What is the most widely eaten fruit in the world?" Well, my first day in Japan this trip brought an unexpected surprise. As I've continued to work with my venture partner over here, it seems that they attempt to outdo themselves each time they take me out to lunch. Today was no exception. Today, we went from Ginza to the garden (and restaurant) at Happo-En. As recently as 1951 (after having been known as a garden area since the Edo period), this garden measured 44 square miles! It's now just only a few acres - but it is spectacular. Most people go there these days for the exquisite food. ...Continue reading "The Garden and Lunch at Happo-En"
There ain't no shrimp in this grilled gumbo! But, there's almost everything else! My assignment for 'interpreted dish' at the current Pragmatic Chef contest is Scott's own "Gumbo with chicken, sausage, and shrimp". Wait! I'm supposed to interpret the master? Shudder the thought! Oh well, might as well give it a try. Scott's such a great guy that he probably won't make too much fun of me. Let's get started shall we? ...Continue reading "There ain't no shrimp in this grilled gumbo!" My friend Scott at the Pragmatic Chef has been hosting a recipe contest and he's decided to allow submissions through the weekend. I'll post mine here and send it to him for posting over at his blog as well. To honor back home Louisiana cookin', I offer grilled Northwest salmon - with a twist. ...Continue reading "Cajun Salmon and Fixin's..."